Like any HIM professional in search of the ideal position, you diligently scan the newspaper, spend hours searching online job boards, and faithfully hand out your business card at networking events. Still, once you find the perfect job, you have to gain the attention of your prospective employer to land an interview. With that in mind, what’s the most effective means of grabbing that coveted face-to-face opportunity? Any human resources director or employment agency will tell you: a well-written, eye-catching, and shamelessly self-promoting résumé. Before putting pen to paper (or fingers to keyboard), evaluate why you’re looking for a particular job. This is a great time to consider switching jobs or moving into a new role. However, HIM professionals first must understand that the career change must occur for the right reasons. For example, the opportunity to learn new skills and tackle unfamiliar challenges is a legitimate reason to explore a career move. Many individuals change jobs simply because an opportunity becomes available. Keep in mind that there is a fine line between job-hopping and career building. Job-hopping is evident when someone frequently changes positions without valid reasons. On the other hand, there are telltale signs of when an individual is making a move for all the right reasons, such as a promotion, the opportunity to experience a different work environment, or the chance to join a more reputable company. • clinical and coding knowledge, particularly if the position involves becoming part of the CDI team. Before pursuing a position, be certain it’s the right fit. How do your previous or current responsibilities line up with the position requirements? Does your résumé reflect your experience to date? Why are you the candidate who should be hired? • Education and credentials: Feature these details prominently on your résumé. What is your formal education? What other training classes have you attended? Obtain your credentials immediately following graduation to demonstrate your commitment to the profession and that you’re serious about embarking on an HIM career. • Projects completed during training: Briefly describe any projects you completed while in school or during internships. What did you accomplish? What skills did you hone during these experiences? • Volunteer work: Include any HIM-related work that you performed while in school regardless of how trivial it may seem. This shows initiative and can help separate you from other candidates. Most employers will look for a candidate who has some relevant work experience. New HIM professionals may want to seek entry-level positions in which they will receive mentorship. For example, one HIM Connections client recently funded postgraduate coder positions specifically geared toward new graduates. The benefit for new professionals is obvious: They receive the coveted experience most employers are seeking. On the other side of the equation, employers can develop coders internally to meet their facility-specific requirements. This strategy combats coding shortages, which will only be exacerbated as the industry moves toward ICD-10 implementation. It also enhances retention because it demonstrates the facility’s willingness to invest in the employee. It’s a win-win scenario for everyone. Regardless of experience level, a candidate’s résumé should serve as a snapshot of more than a dissertation on work history. A great résumé doesn’t just tell potential employers what you have accomplished; it convinces them that you have what it takes to be successful in the new position or career. • Keep it simple. Include only relevant work experience from the last 10 years (or a maximum of two pages). Busy hiring managers and recruiters review hundreds of résumés per day. Some will scan your résumé only to determine whether it includes certain keywords. Use bullet points when listing primary job responsibilities. • Tailor content to fit the job description. This may require extra work, but it will help separate you from other candidates. Search the job description for key terms (eg, EHR, CDI, process improvement) and be sure to include them in both the résumé and cover letter. • Briefly highlight your successes. If you’ve reduced the discharged not final billed total, improved physician response rates to queries, or overturned a significant recovery auditor denial, include these or similar accomplishments. • Highlight ICD-10 knowledge and experience. 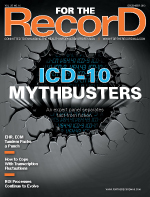 Candidates who have undergone some type of ICD-10 training—either formally or informally—have an advantage. Be sure to list any self-study you’ve performed, as this is particularly impressive. • Ensure 100% accuracy. Dates matter, as do the specifics of your responsibilities. Don’t tout a skill if you can’t demonstrate it. • Proofread and edit. Don’t forget to run spell check. Also ensure that your résumé flows and is easy to read (ie, in chronological order). Use the present tense when describing current job responsibilities and past tense when referring to previous job responsibilities. Use action verbs such as perform, provide, or manage. Ask a trusted friend or colleague to read your résumé and offer suggestions. A reputable recruiting firm also can provide sound advice on how to improve your résumé as well as offer network opportunities to enhance your job search. No matter what strategy HIM hopefuls employ, it’s important to understand what potential employers are seeking and how best to present the applicable attributes. — Kayce Dover, MSHI, RHIA, is president and CEO of HIM Connections.